West Chiltington is a beautiful village in Sussex, and like much of the county it's full of trees. Horsham Tree Surgeons provide first-class tree care services to clients in the whole area, from Pulborough to Storrington and Coolham to Adversane. 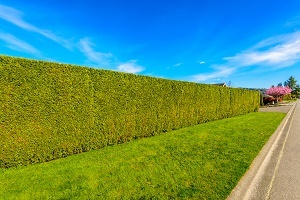 Not only do we provide tree services, we also look after your hedges with one-off trimming or regular maintenance throughout the season. If you look after your trees and hedges, they will repay you by staying healthy and lush. As qualified tree surgeons in West Chiltington and surrounding areas, you can be sure that our experienced staff know exactly how to prune or fell your trees and they are able to remove trees with a minimum of disruption, always leaving your site clean and tidy. As well as tree surgery, we also offer fence erection services in the West Chiltington area. Whether you need smart new equestrian post-and rail fencing or privacy for your garden, you can rely on the experts at Horsham Tree Surgeon to do a great job. And when you need logs for your woodburner or open fire, we can supply those too.